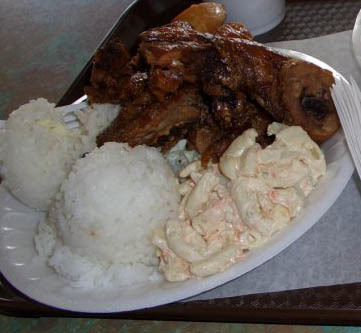 The plate lunch is a syncretic menu item that is a quintessential part of the cuisine of Hawaii. Standard plate lunches consist of two scoops of white rice, a scoop of macaroni salad, and a main entrée. Many plate lunch outlets also sell "mini-plates" which come with the same entrées in smaller portions. Although the exact origin of the Hawaiian plate lunch is disputed, it goes back to the 1880s when plantation workers were in high demand by the fruit and sugar companies. Laborers were brought from around the world including China, Japan, Portugal, and the Philippines who would eat leftover rice and things like canned meat or teriyaki or cold meat or maybe scrambled eggs or pickles, and almost no salad or vegetable. Mayonnaise macaroni and gravy for the meat were later added. As the days of the plantations came to an end, the plate lunches started being served by lunch wagons to construction workers and day laborers. There are a number of popular entrées that come with plate lunches, mostly of Asian influence or origin. Notably from Japanese origin is chicken katsu, fried boneless chicken breaded with Japanese bread crumbs, and beef teriyaki (often shortened to "teri beef"). A common side-dish with plate lunches is fried noodles, often made of either chow mein noodles or sometimes saimin noodles. A notably American facet of the plate lunch is the hamburger steak, a hamburger patty smothered with brown gravy and placed on top of rice. When a fried sunny side up egg is added onto hamburger steak, it becomes a Loco Moco. In many plate lunch restaurants, you'll find entrées of Hawaiian origin as well, like kalua pork (also called "kalua pig") and lau lau. Some side dishes of Hawaiian origin include lomi salmon (also called "lomi-lomi salmon") and haupia (a coconut dessert). In many local Korean restaurants, many Korean entrées are available with plate lunches, including kalbi and meat jun. Some side dishes include taegu, and namul, a dish made of seasoned soybean sprouts.